Scandinavian-based slots developer Net Ent is often labelled as one of the most creative names on the market being able to launch slots based on big budget brands as well as their own innovative titles with the epic Aliens slot and the millionaire-maker Mega Fortune slot respectively just two examples of that. 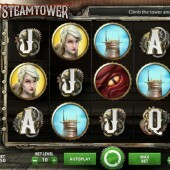 Steam Tower is a 5 reel, 15 payline slot that has an industrial theme to it. Those of you that grew up with the hit Will Smith movie Wild Wild West might feel a sense of nostalgia playing this with the steampunk design firmly coming to the fore in this slot. I never really liked that particular Will Smith movie so I'm hoping to lay that ghost to rest with this slot. The aim in this slot is to rescue the princess from the top of the Steam Tower that the slot title is based upon. Unfortunately, there a rather temperamental dragon that stands between you and the big wins... sorry, I mean princess. Symbols on the reels include a dragon's eye, the male hero, the princess, the tower itself, and the regular Jack-through-to-Ace symbols. The Wild symbol is represented by our hero's rocket propelled weapon. These Wilds have the power to substitute for all other symbols. This slot also comes with Stacked Wilds and these are represented by the hero himself. If you hit one or more of these Stacked Wilds across the reels in the base game then you will trigger the free spins bonus round where you will be awarded 10 free spins and proceed to the first level of the tower. If you hit one or more normal Wilds across the reels during the free spins bonus round then you will earn an extra 2 free spins and the game moves on to the next floor. This can continue until you reach the 16th floor which is the top floor. The free spins bonus round madness does not stop there. A multiplier is awarded to any winnings hit during the free spins and the multiplier value depends on what level of the Steam Tower you are on. For example, if you are on the first three floors you will have a multiplier value of 2x. If you are on floors 4-6 then the multiplier value will increase to 3x. The multiplier value will be 4x for floors 7-9. This is upped to 5x on floors 10-12. On floors 13-15 the multiplier value is 6x and, finally, the top level of floor 16 has a multiplier value of 7x added to any winnings on the free spins bonus round. 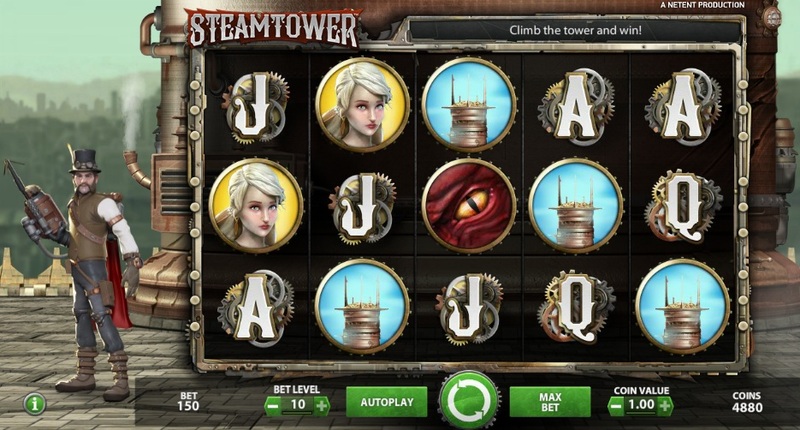 Steam Tower has this fantastic layered multiplier level system which is similar to WMS Gaming's Nemo's Voyage slot with its Wild levels. Unfortunately, the fun is not as widespread on this slot and if you don't trigger the free spins bonus round then it feels like a fairly fruitless session. However, if you are privileged enough to make it to the free spins bonus round then that is where the real action begins... unless you strike out early on. Initially, I had high hopes for this slot and loved the idea of levels for multipliers. This game seriously lacks depth though and I don't think it is one that will live long in the memory for slots players.